WHAT ON EARTH SHOULD I PACK? This was something that I was really overwhelmed about before our holiday. Having never skied before I had no idea what to pack for both us and the children, nor where I should get things from either. Luckily after talking to friends who had been skiing and also seeking advice from the lovely people at Ski Famille we got together a list of what we should bring. We made the mistake of ridiculously over packing and packing lots of non skiing clothes for us all, things like jumpers and jeans etc, but we really didn’t need to have bought anything else, especially for the girls. They lived in their base layers in the chalet and bar one night when we went out for dinner they didn’t wear any other clothes. We put on lots of comfy clothes in the evening, like jumpers and jogging bottoms, but you really don’t need to pack many other clothes at all. 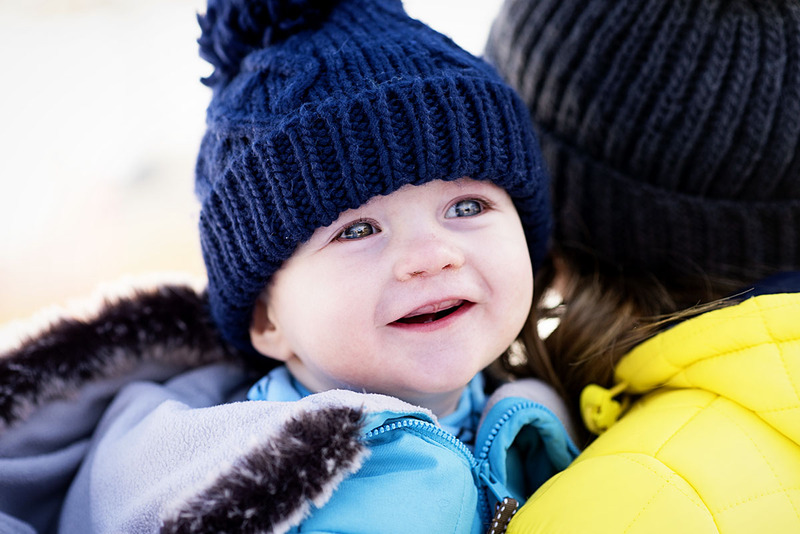 Woolly hat – one that covers their ears is ideal. Ski gloves – The mitten type tend to be warmer than the ones with separate fingers. Thermal base layers – tops and leggings. 2 x pairs, maybe even 3- the girls lived in these. All in one snowsuit with feet. WHERE SHOULD I GET MY SKI GEAR FROM? Again this was another thing that overwhelmed us a little before we left. Ski Gear can obviously be quite expensive, but if you look around you will find there is some bargains to be had. Before we went we decided we would get really nice jackets as an investment and then buy cheaper base layers etc as of course you don’t see them. We found the very best place to shop for ski gear was Aldi of all places- I picked up my ski boots, socks, and base layers from there, as well as some bits for the girls too. They are super cheap and really great value, but apparently when ski season starts they sell out really quickly. 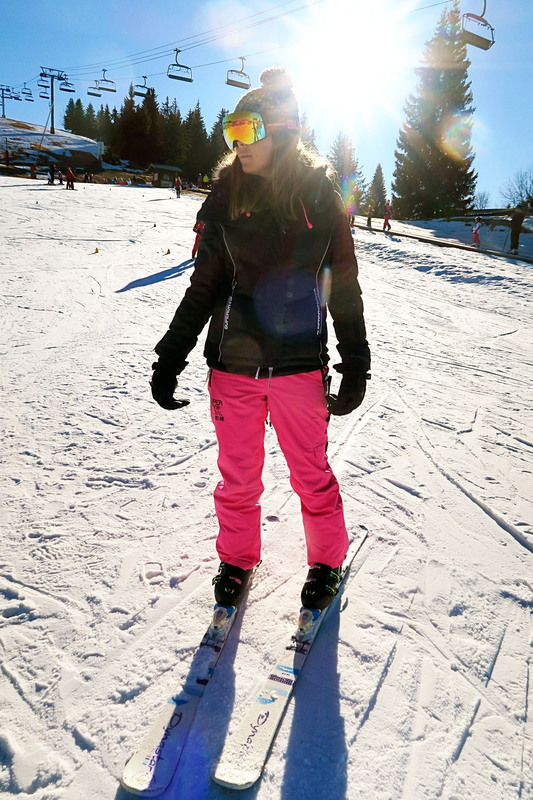 We got our jackets and goggles from Superdry, a brand we absolutely love and adore, and their ski stuff is just lovely. It’s a bit on the pricey side but for an investment like a jacket they are great, and we got a fair few compliments about them out on the slopes. The girls amazing salopettes, jackets, goggles, base layers and boots came from Muddy Puddles- they do a great ski range which is a fantastic quality and really stylish too. 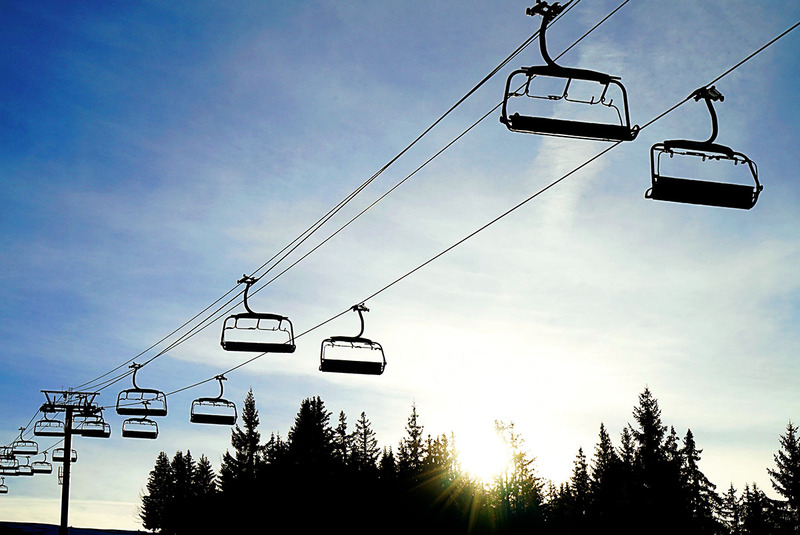 HOW OLD CAN YOUR CHILDREN BE TO SKI? 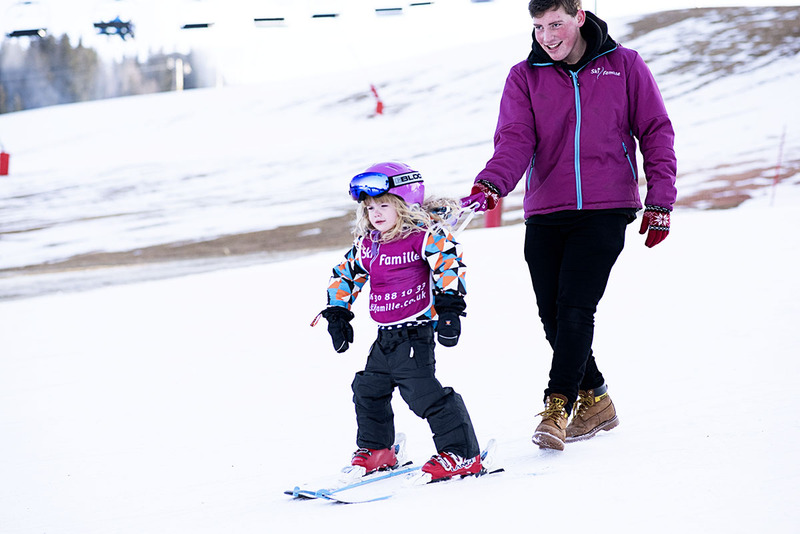 A lot of resorts and companies offer ski lessons at four, but Ski Famille over them at three, the littler ones go out for slightly less time for their lessons than the bigger ones. 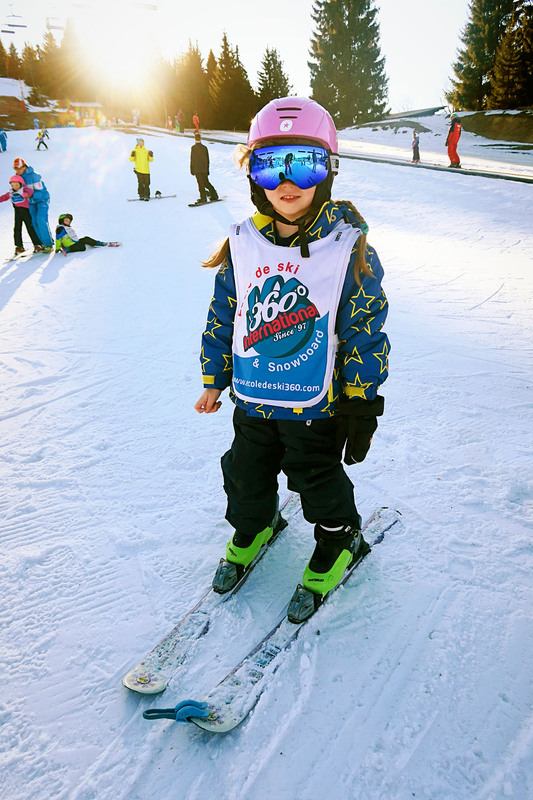 We knew that our eldest daughter, age six would absolutely love skiing and after an initial confidence blip she was soon flying down the slopes, moving up levels and growing in confidence every day. Our youngest daughter aged three just wasn’t as keen and after three days we made the decision to stop her lessons. That said the ski instructors were amazing with her and there were three year olds in her class doing amazingly, I just think she wasn’t ready for it. It is definitely great to start them young and I heard from a fair few people while they were out there, and indeed some of the Ski Famille team themselves who had been skiing since they were tiny. Ski school is included in Ski Famille’s Mountain Marmots childcare. 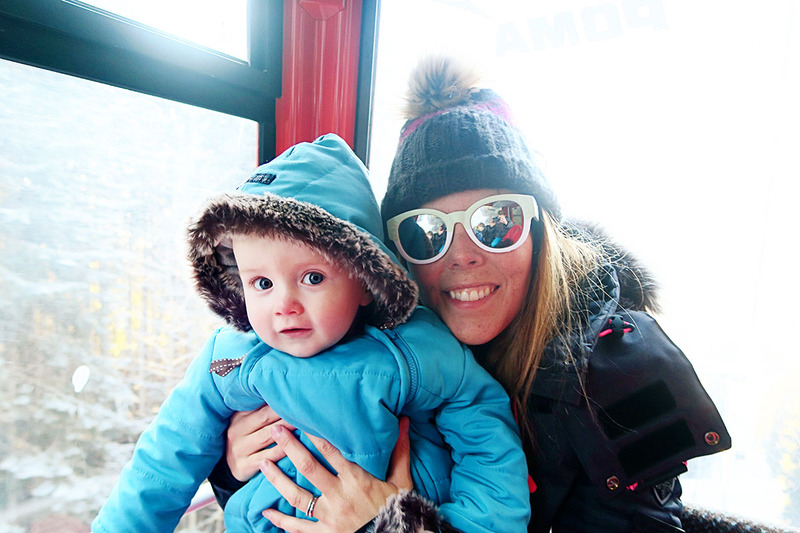 I HAVE A BABY, IS A SKI HOLIDAY NOT SUITABLE UNTIL HE IS BIGGER? 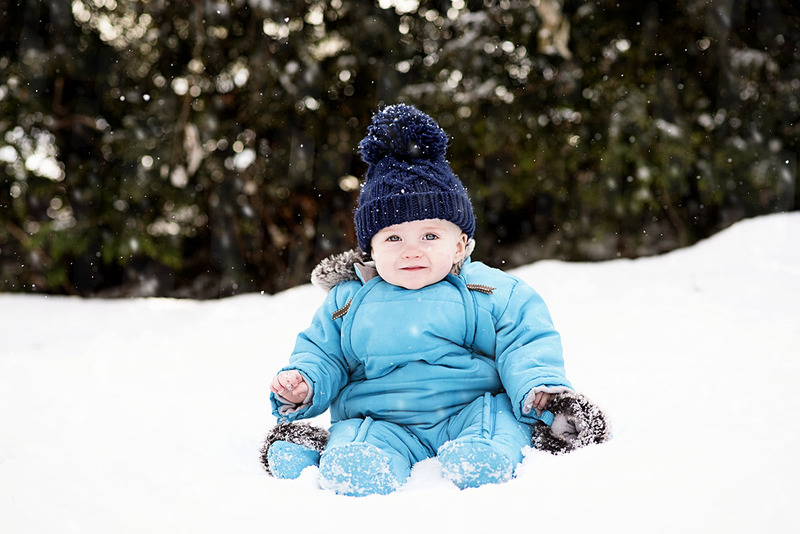 At first it is hard to imagine that cold weather, snow and mountains would be particularly suitable for a young baby, and indeed it is something we weren’t sure about before we left. In actual fact we need not have been worried in the slightest. The Ski Famille childcare team made sure that every worry I had was completely erased. I will talk more about the childcare below but we managed to get into a routine where Jon and I went off skiing in the morning, I would then come home at lunch and breastfeed our baby boy, we would then go out for lunch on our own (which was such a luxury) and then come back and spend the afternoon as a family. They really fit into our needs and I felt very relaxed leaving him with them, even though it was the first time we had left him before. 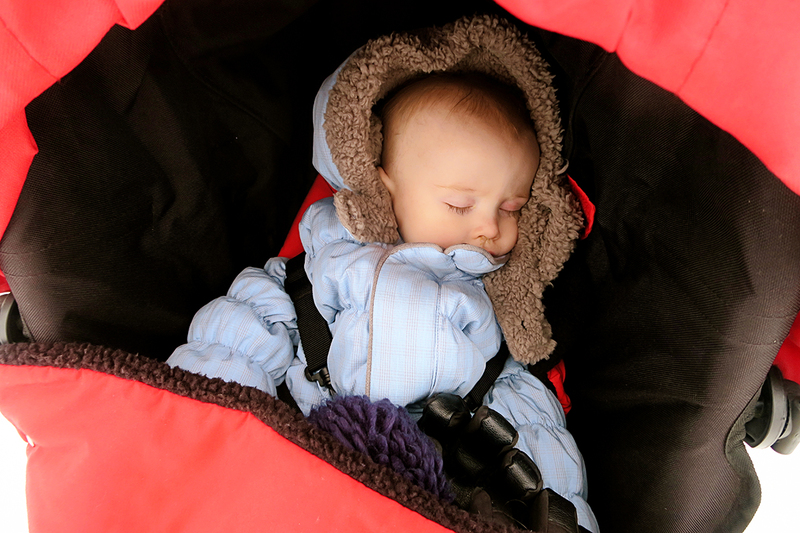 Ski Famille provide baby monitors for your room, nappies and wipes and lots of toys to keep babies and young children entertained. He went on lots of long walks with the childcare team, he came up the mountain with us lots to watch his sisters ski (the bubble lifts are really accessible with pushchairs), and he went on the Les Gets train a few times. 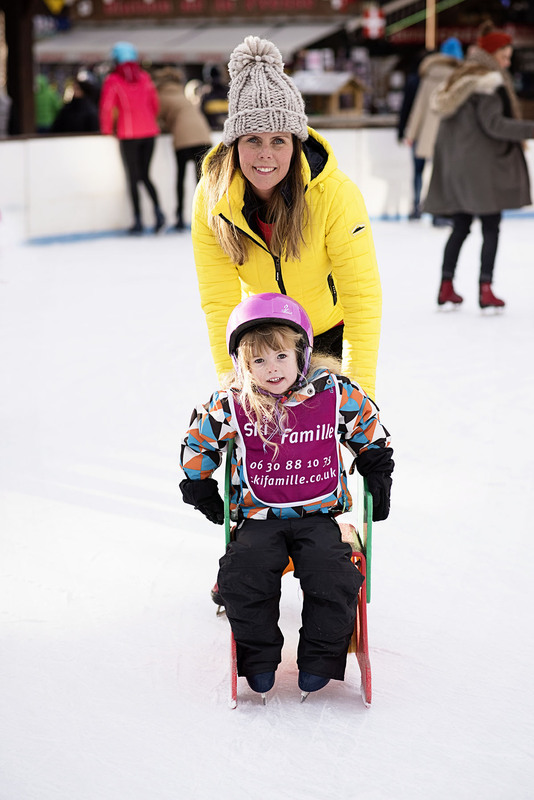 Another thing to note is that Ski Famille provided a few different all weather terrain Mountain Buggies in Chalet Marjorie as well, if we had known this before we probably wouldn’t have bought our own pushchair and would have put our baby boy in a carrier at the airport. It’s a really lovely family resort and after this holiday I can definitely say that it’s a holiday you most definitely can go on with young children. 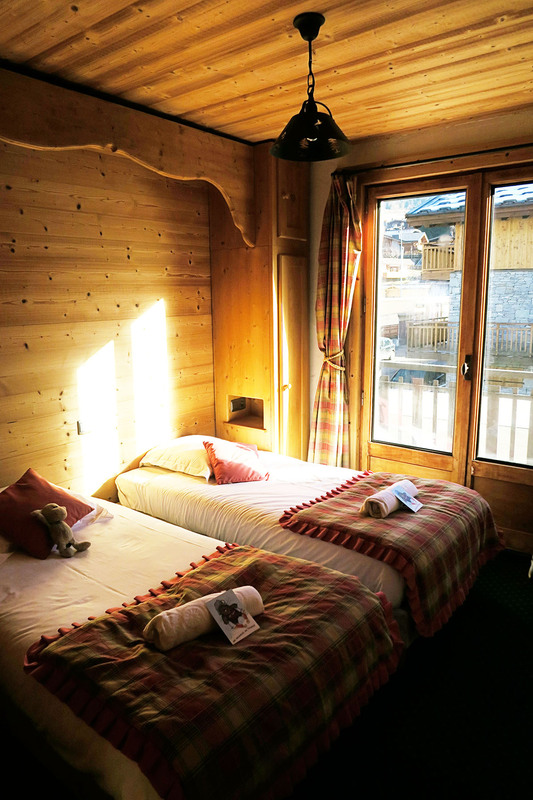 WHAT ARE THE SKI FAMILLE CHALETS LIKE? We stayed in Chalet Marjorie which is a lovely homely chalet based right in the centre of Les Gets village. Ours slept 22 people and we were in with 4 other families who we didn’t know. Of course every chalet is different, Ski Famille have some more modern ones in Les Get including Bacall and Bogart which looked lovely, as well as Le Chats Bleus which looked amazing (check out the hot tub), but we were recommended Marjorie because it was close to the ski lifts, close to the town centre and really homely. I couldn’t agree more, we couldn’t fault it. It was cosy, felt really snuggly after a day on the slopes, and was big enough so we weren’t all on top of each other. It was always clean and there were games for the adults and lots of toys for the children. HOW DOES THE CHILDCARE WORK? The childcare was one aspect I was really nervous and intrigued about before we left, after all leaving your precious little people with someone you don’t know is very daunting, and we have only done it once or twice on holiday before. I should start by saying I couldn’t fault the Ski Famille childcare, it was absolutely incredible. The childcare is flexible depending on your needs, (you can find out more about it here) but you can basically choose to have them in a morning or afternoon session or both. 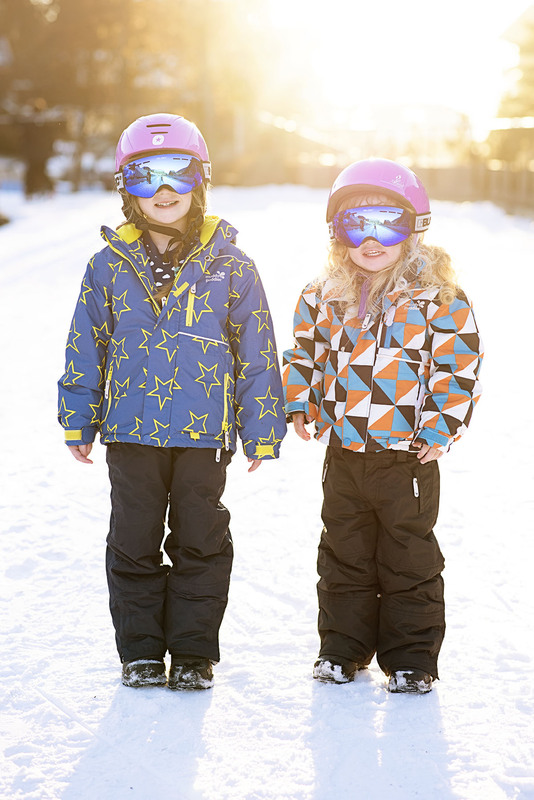 In the morning older children will generally go out to ski lessons (which are included for 3-12 year olds) and then will come back and have lunch, before either being signed out for family time or doing activities in the afternoon. 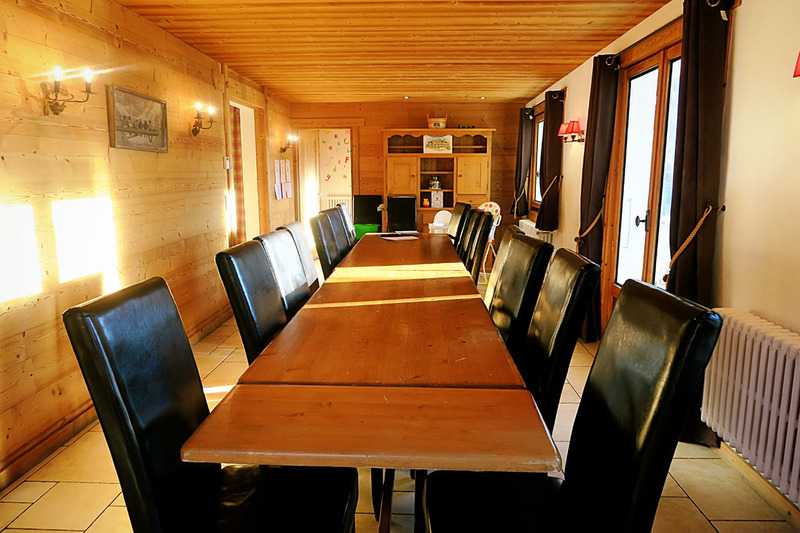 All childcare takes place in your chalet, which is a big positive and made it for us. It meant that it was really relaxed, the children felt relaxed, and they could keep to routine. The nannies arrived in the morning at half 8, with some taking the children off to ski school (one HUGE thing that made the holiday for us is that the Ski Famille nannies go up the mountain on skis with the little ones during their ski lessons- I think our experience would have been very different if it wasn’t for this, as having them there gave my little girls the confidence. Not a lot of childcare providers do this and it’s so brilliant) while a couple of them stayed in the chalet with the littlest ones. It meant that our baby boy could nap in our room and keep to that routine. The nannies would then give the children lunch and then it was time for afternoon club. I definitely recommend booking full days as it just makes it easy to come and go as you please. Most days we didn’t actually end up using the afternoon club as we wanted family time, but it was great to have the option. In fact on a fair few of the days we went out with the nannies and did the activities they were doing as the girls wanted to spend time with their new friends- we went sledging one day, ice skating and on a scavenger hunt around the town. The nannies were so good with them and played lots of games indoors as well as taking them out on the train, for hot chocolate and to build snowmen. They were also really flexible with letting us come and go to feed our baby boy who is still breastfed. I genuinely couldn’t fault the childcare. I felt my children were happy, loving their time there, and more importantly I felt they were safe, cared for and that the nannies spent a great deal of time getting to know them. In fact we had a really lovely time with them all week and missed them once we were home. IS IT STRANGE BEING IN A CHALET WITH PEOPLE YOU DON’T KNOW? This again was something I couldn’t imagine really before we left. We were in a chalet with four other families, no one knowing each other before we arrived. You all eat breakfast and dinner together on a long table and the chalet has a very relaxed atmosphere, we weren’t given a key for our room door for example. However by the end of it the kids were all running in and out of each other’s bedrooms, it was so nice. We got on really well with the people in ours, although they were all quite different to us, we were all relaxed and on holiday. We ended up staying up till at least 1am drinking and playing board games with everyone, it was a lot of fun, and we also went skiing with them a couple of times and out for lunch. We haven’t kept in touch, bar on Facebook, with anyone we met, but that doesn’t mean it wasn’t fun. We had a great time and it pushed us out of our comfort zone and to meet new people, it was really nice getting to know everyone and chatting for a week. In Chalet Marjorie in the evenings it was really relaxed and lovely. The keen skiers who had been out all day would get home by about 4 and then was always afternoon tea laid out by our chef Ben (usually a delicious cake). The children would have their dinner at 5pm and then we would all chill in our rooms for an hour or so, or the children would run about and play, or watch a film upstairs. We would then put them to bed and our amazing chalet hosts Daisy and Jake would lay on aperitifs at 7.30pm in our lounge upstairs with a glass of bubbly. Dinner would be at 8pm usually and would always be a 3 course meal. We would chat downstairs for ages before all going upstairs to the lounge and relaxing with a few drinks. Quite often we would get really tipsy, with us playing hilarious drinking games and with all the men going out into Les Gets on a few occasions. It’s really relaxing and good fun. On a Wednesday it is the chalet night off so dinner is left for the kids but you need to go out or get take away. The rest of the families in our chalet actually all went out together on the Wednesday night (you can hire the nannies to babysit for an extra cost) but we took the children out for dinner and bowling. There are loads of lovely restaurants in Les Gets. 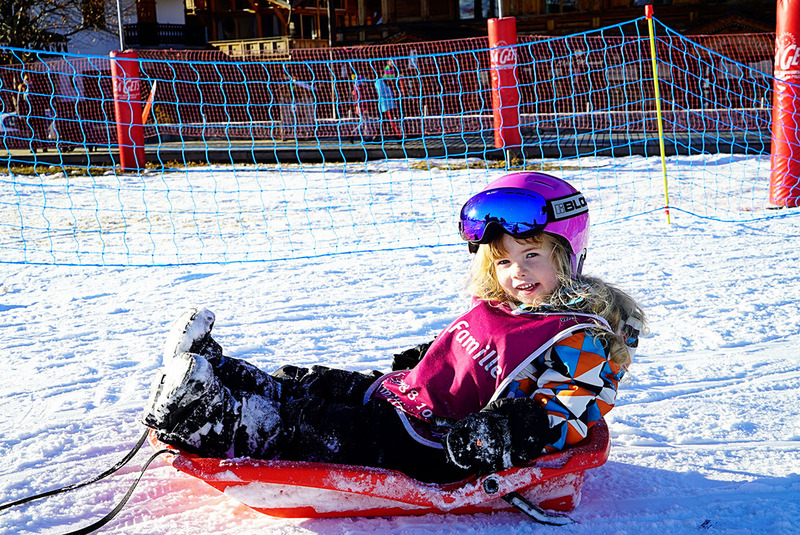 WHAT FACILITIES ARE THEIR FOR FAMILIES IN LES GETS? Les Gets is a real family friendly resort. It’s small, with direct access to the ski lifts and it’s big enough to walk around without little legs getting tired. We got to know people to smile and wave at over the course of a week which was lovely. There’s quite a lot for families to do. There’s a little Les Gets train which does a loop around the village every 15 minutes which is free and which the children loved. There is also a fair few playgrounds dotted about. There is of course sledging and a lovely little sledging hill that is safe and away from the skiers (Ski Famille provided sledges free of charge in Chalet Marjorie). There is also a little bowling alley bar which the girls loved (definitely worth booking in advance when you arrive as it does get booked up) and also a little cinema as well. At the end of the day though children just love the snow, building snowmen, having snowball fights and just generally being together. I’VE NEVER SKIED BEFORE, IS IT HARD TO MASTER? I genuinely thought I would be terrible at skiing and would struggle to pick it up, but by the end of the week I was whizzing down runs (albeit mainly blue and a couple red). You soon get used to skis and you soon pick up confidence too. As the snow was quite thin on the ground when we first arrived in Les Gets it was quite flat packed and icy, but when it snowed towards the end of the week you got that lovely powdery snow which meant that you had more control while skiing- this was brilliant and helped my confidence no end. I was most nervous about the ski lifts, I have no idea why, but you genuinely do get used to it and pick it up really quickly. It’s so much fun and I can’t wait to go back again one day and do it all over again. My six year old surprised me the most, she was a natural and loved every second. WOULD YOU RECOMMEND A SKI FAMILLE HOLIDAY? Absolutely. From the second we booked to the second we arrived home, I couldn’t fault Ski Famille. They are a fantastic company, with years of experience, but the main thing and their biggest asset is their staff. You can tell that they treat their in resort staff well, when we were there they were having a girls pamper evening one evening and they were saying about how Ski Famille offer lessons to their staff too. 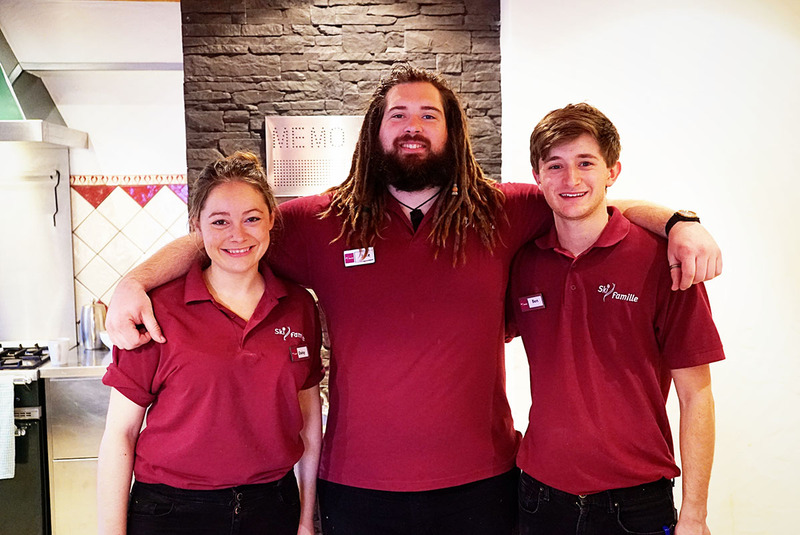 In turn because they treat their staff well, their staff really feel valued and respect the company, meaning they are happy and work hard to make your holiday enjoyable. All the Ski Famille staff we encountered in Les Gets were quite honestly brilliant we I genuinely felt sad to be saying goodby at the end of the week. 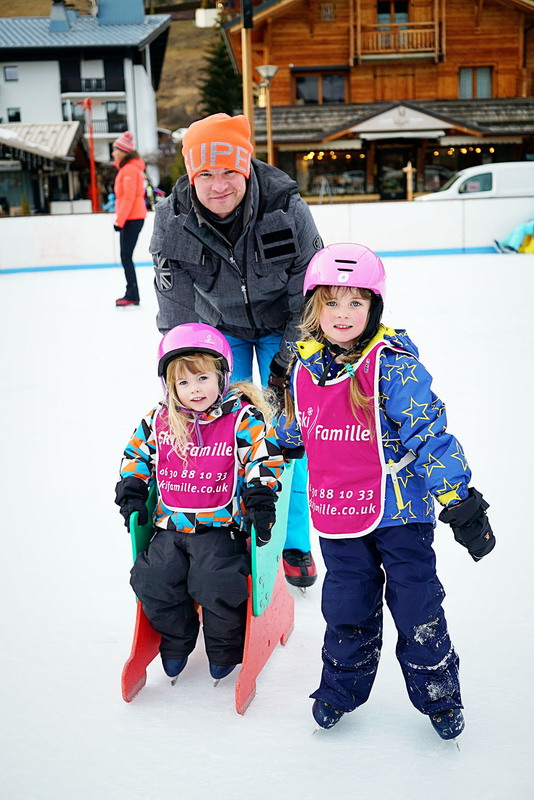 The Ski Famille package is great, it takes the stress out of your holiday, meaning you can just relax and enjoy it. We loved every single minute. Great post, Katie. I love their snow jackets – they’re so stylish! It’s great that the age is lower for them to have skii lessons. My girls would absolutely love it! We are big ski advocates as well, and I agree with your list, but I would take goggles and sunglasses for sunny stops on the slopes so you don’t have to wear goggles! it really is the best holiday!